This year we are marking 50 years since Dublin Simon Community first began. What motivated our first volunteers from Trinity College and UCD to set out on that cold February night onto the streets of Dublin still continues to be the driving energy of our experienced and trained volunteers and staff working across our services today. It is hard to put into words, but ultimately it is the same compassion that motivates people like you to support our services and help the men, women and families who are facing some of the toughest times of their lives. Our Soup Run still continues 365 nights a year and in the time that has passed our services have evolved to meet the changing face of homelessness. Your support this spring will mean that we will continue to be there for people when they need us most. Please click on the link below to support us today with your life changing donation. You can also support us by setting up a Direct Debit. This will help us plan for the future and develop new initiatives to assist more people experiencing homelessness. Please click on the link below to learn more about regular giving. 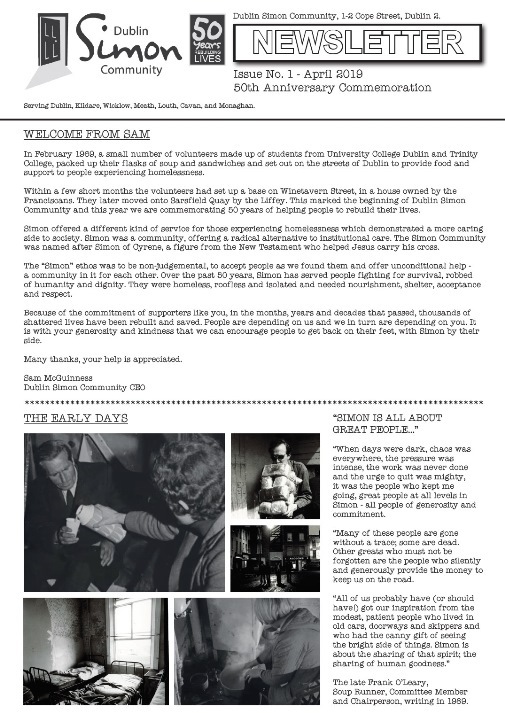 Learn about the founding of Dublin Simon Community in our 50th Anniversary Commemorative Newsletter below. You can help provide these vital services by making a donation. Help us plan for the future by signing up for a direct debit. Each and every face that comes to our door is unique and has their own story to tell. Thanks to the kind support of people like you, we can continue to help people rebuild their lives and begin their journey out of homelessness. If you have any questions on our services or would like to learn more about how you can help please call 01 671 5551 or email fundraising@dubsimon.ie. Read our clients’ words below for just a snapshot of the difference you have made over the past fifty years. “I first became homeless in the 1980’s after my mother died. I couldn’t cope. Simon were always there for me. The Soup Run would stay in touch and make sure I had enough food and sleeping bags. I remember the day I realised that something had to change. I woke up one morning under a bush and I knew I had to do something. I had heard about the new Detox service being run by the Simon Community and decided to give it a try. “When I became homeless in 1999 the first words that came to me when I asked who was going to help us was Dublin Simon Community. What they do is they give you a lifeline. You’re still on the streets but you have someone who cares. The Simon Community is all about caring about people. need to be somewhere that Simon can find you in the morning. “When I contacted the Simon Community I was lost. They helped me so much. My case worker helped me find my ‘castle’ but it wasn’t just that. She helped me become someone. I was now a tenant, a person who mattered, an individual who had a place in society. I’ve been in my new home nearly six months and I love it. A pack for our Breakfast Run to provide a positive start to the day. An evening of respite at our Social Club for a friendly chat and a cup of tea. Towards a safe and warm bed for a night in our Recovery unit for someone trying to rebuild their life.